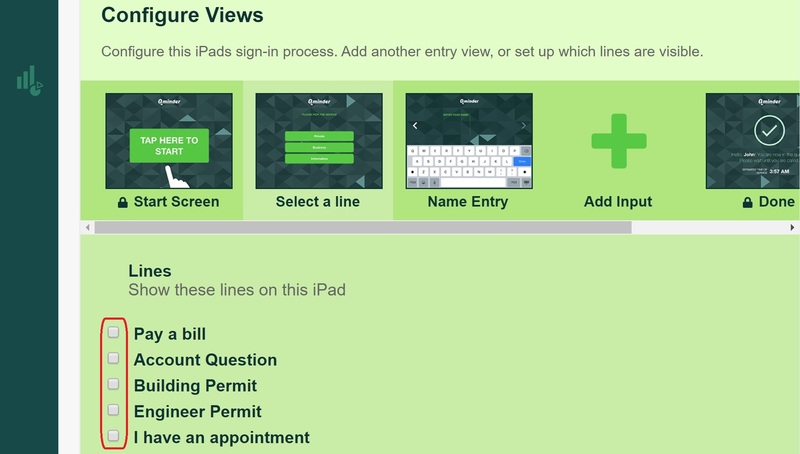 How to choose which lines visitors can select on a Sign-in iPad. This article will show you how to configure the iPad Sign-In app to hide lines you don't want to show on an iPad. You can customize the visitor sign-in flow completely to suite your location's needs. To find the input field settings for the iPad, go to the Locations tab and click on the location's name where iPad is located. On the next page choose iPad from the menu and then click on the iPad you want to configure. You can select which lines to show on the iPad by scrolling down the settings page, going to the Configure Views section and clicking on "Select a line". You can then select which lines to show on the iPad. Tick the checkbox on the left of the line name to show that line. To hide a line, untick the checkbox on the left. By default, all enabled lines will be visible on the iPad. This means, if a line has been disabled from the line settings, it can't be shown on the iPad. Enabling the line from the line settings will show it on the iPad again. After changing which lines are selected on the iPad, make sure to click Save to confirm.